Sci-fi effects extravaganzas are a dime a dozen, but bona-fide sci-fi films—that is, movies that exemplify the so-called literature of ideas and not just the sci-fi aesthetic—are rare. 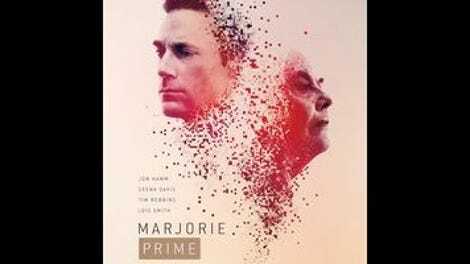 Marjorie Prime, the offbeat indie stalwart Michael Almereyda’s thoughtful adaptation of a Pulitzer-nominated play by Jordan Harrison, isn’t interested in futuristic, high-tech backdrops, even though it seems to be set sometime in the 2040s. The most stylish thing about it is the eerie original music by Mica Levi, the art-damaged noise-popster-turned-composer who previously scored Under The Skin and Jackie. But aside from that, the movie lacks ostentation; it appears so simple and unworldly and unhip that one wants to protect it. This is business as usual for Almereyda (Experimenter: The Stanley Milgram Story, Hamlet), a brainy misfit kind of filmmaker who works with that mostly forgotten credo that indie films should give viewers something that doesn’t look like it was made with any commercial considerations. Perversely, he enlists Sean Price Williams—the most distinctive cinematographer on the new indie scene, known for his raw camerawork—for a film that is about as visually busy as an old teleplay, shot from sitting or lying positions, sometimes under a pinkish cast that fills the film’s only real location, a beach house on the Long Island shoreline, and sometimes in semidarkness. 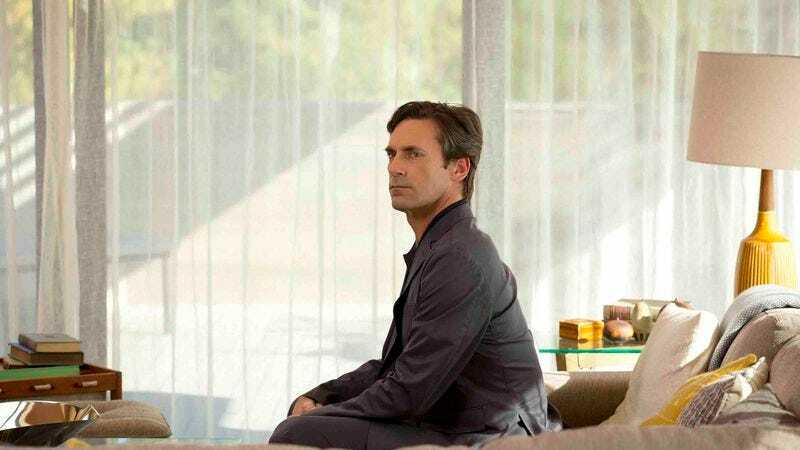 Within this sustained, artificial, inanimate placidity, Marjorie Prime tries to untangle questions of memory and technology. Its premise is simple and strong: Marjorie (Lois Smith, reprising her role from the original stage production), an elderly woman who lives with her middle-aged daughter, Tess (Geena Davis), and son-in-law, Jon (Tim Robbins), has been given a “Prime,” a kind of artificial intelligence that projects an interactive hologram of her late husband, Walter (Jon Hamm, for once getting a deserving dramatic film role), as he appeared in his 40s. This holo-Water is meant to be therapeutic, exercising the mind that Marjorie is losing to dementia through constant conversation. But he’s still a programmable machine—a key point that Marjorie Prime establishes coyly, as Walter deadpans through a story that involves the 1997 Julia Roberts vehicle My Best Friend’s Wedding, only to have the old woman insist that he change it to something more romantic, like “Casablanca, in an old movie theater with velvet seats.” It is the power of selection, not simulation, that makes the Prime so effective as a metaphor and so seductive as a technology. The holo-Walter has nothing to go on except what Marjorie, Tess, and Jon would prefer to have remembered, as well as the structuring absences of those things they would rather not think about—or, more specifically, what each individual member of the family would like to have forgotten. Dramatically, it’s ingenious: the grief and denial that binds families incarnated as a comfort machine. Yet Walter—a much trickier role than the basic set-up might make it sound—is merely the first Prime in this story. Almereyda, who has a unique approach to theatricality, embraces a pared directing style, resting this multi-faceted study of shared and hidden memories—a sort of holodeck Manchester By The Sea—squarely on the shoulders of the terrific primary cast; Davis, who hasn’t had a significant film role since the 1990s, shines here, but so does Robbins, who hasn’t had a part this subtle in almost as long. Few are the moments in Marjorie Prime when the camera makes itself the most conspicuous thing on screen; they are usually punctuations, like a curiously composed wide-angle shot of Jon floating in a pool. And yet, its placement is never arbitrary. Like a Prime, it’s there to create the impression of an unbreakable pastel lull; the longer it keeps at it, the more disquieting it becomes.